Many young drivers assume that in a world of cell phones, roadside assistance and a gas station on practically every corner, there is no need to plan for an emergency. However, the world is a vast place, and one day you might end up driving in an area that doesn’t offer the resources you’re used to. What would you do if you skidded off a country road on an icy night and found yourself in a spot without cell phone reception? What if this happened miles from town? This item isn’t exactly a part of the emergency kit, but it’s important to have on you at all times. It would be bad to find yourself stuck in an area without reception, and it would be even worse to have reception but still be unable to call for help because your cell phone is dead. Windows can ice up fast in bad weather. If you live in a cold area, an ice scraper will be very useful. If you were to crash off the road and become injured during cold or snowy weather, you might have to wait for some time until help arrives. Staying warm could potentially save your life. 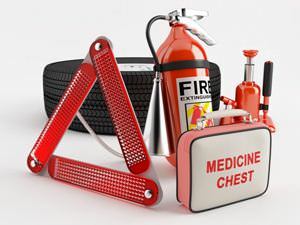 Keep a small first-aid kit in your car that includes bandages, ointments, painkillers, tape and emergency doses of any important medications that you may need. You never know when you might need to jump start a car. If you’re lucky, a kind stranger will have jumper cables and be willing to help you out. If you’re unlucky, you may have to ask a variety of people before you find someone who has the tools and willingness to give you a jump start. If your car breaks down on a dark country road, you won’t have the headlights to help you see. Always carry a flashlight in your car. It could prove to be useful in a number of situations. As with jumper cables, if you have your own towing rope, it will be easier to find someone willing to help you out of a bind. If you have a powerful truck, you could also help someone if needed. Always carry an extra pair of work gloves and some old shop rags in your car. Hopefully you won’t ever need them, but if you do, you’ll be glad you were prepared. Duct tape is a powerful tool that can be used to fix just about anything. There is a story of a young woman on a solo trip across America who had her entire front bumper fall off just outside of Kansas City. She was able to duct tape it back in place until she could get to a repair shop, and this saved her the cost of a tow. Always keep a gallon of water and some nonperishable food in your car. Things like granola bars, peanuts and beef jerky are good choices. If you know you’re going to be driving in bad winter weather, consider stocking up on enough food to last a few days.